Fought C.S.S. 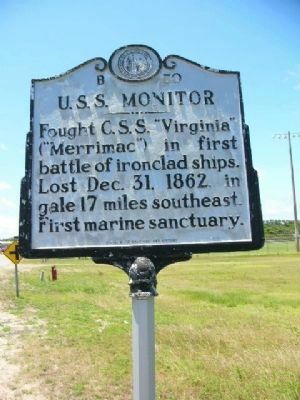 "Virginia" ("Merrimac") in first battle of ironclad ships. Lost Dec. 31, 1862, in gale 17 miles southeast. First marine sanctuary. Location. 35° 15.953′ N, 75° 31.236′ W. Marker is in Buxton, North Carolina, in Dare County. 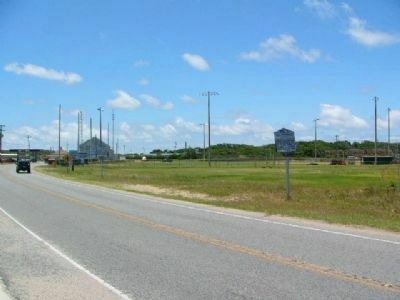 Marker is on State Highway 12, on the right when traveling south. Touch for map. Marker is in this post office area: Buxton NC 27920, United States of America. Touch for directions. Other nearby markers. At least 8 other markers are within 10 miles of this marker, measured as the crow flies. Diamond Shoals (here, next to this marker); Radio Milestone (approx. ¼ mile away); Cape Hatteras Lighthouse (approx. ¼ mile away); Billy Mitchell (approx. ¼ mile away); Life at the Light (approx. 1.1 miles away); Paukenschlag (approx. 1.4 miles away); Mitchell Demonstrates Air Power (approx. 6.2 miles away); America's 1st Attempt at Civil War Reunification (approx. 10.1 miles away). Touch for a list and map of all markers in Buxton. "The wreckage of the ironclad was discovered in 1973 by a team of scientists from Duke University, the State of North Carolina, and the Massachusetts Institute Technology. As part of a series of marine sanctuary laws passed by the U.S. Congress, the site of the wreck was designated a National Marine Sanctuary on 30 January 1975 and placed under the protection of the National Oceanic and Atmospheric Administration (NOAA). Owing to deterioration of the wreck from storm and other damage, some artifacts—such as the propeller shaft and hull plates—were later recovered for historic preservation. Starting in March 2001, a five month long expedition involving NOAA, the Naval Sea Systems Command (NAVSEA), Mobile Diving and Salvage Unit Two (MDSU TWO) and The Mariners’ Museum, raised the ironclads innovative steam engine and other parts recovered at the site. The following year, in July and August 2002, the gun turret was raised from the site. These artifacts were transferred to the Mariner’s Museum in Newport News, Va., for historic preservation." — Submitted September 16, 2008. More. Search the internet for U.S.S. Monitor. Credits. This page was last revised on June 16, 2016. This page originally submitted on September 12, 2008, by M. L. 'Mitch' Gambrell of Taylors, South Carolina. This page has been viewed 1,485 times since then and 16 times this year. Photos: 1, 2. submitted on July 1, 2009, by Kevin W. of Stafford, Virginia. • Craig Swain was the editor who published this page.